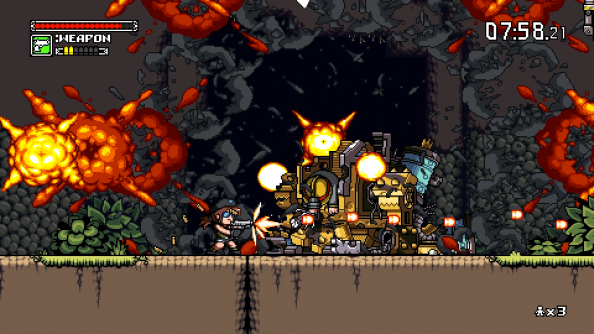 Sure, everyone has kind of forgotten about Mercenary Kings, the early Kickstarter darling that blended Scott Pilgrim pixel art with Metal Slug side scrolling shoot ‘em up action. But the game launched on Nintendo Switch February 6, and with that launch came a major update that radically changes how the game is played on every other platform, PC included. Here’s our list of indie games to look forward to in 2018. Tribute Games have used the Nintendo launch as an opportunity to rework some of the things in Mercenary Kings that caused players (myself included) to bounce off their brightly-illustrated platformer back when it first came out. The “Reloaded” edition, which updates all existing versions, adds a better tutorial, new playable characters, and additional weapons to the game. But perhaps most importantly, in the Reloaded edition, boss escape timers don’t start counting down until you reach their arenas. This eliminates a massive amount of frustration and stress from the game’s original format – enough to make a revisit potentially worthwhile for players who bounced off four years ago. Since we’re still months away from the release of Monster Hunter World on PC, Mercenary Kings’ loot-and-grind might very well scratch the itch until then. Either way, it’s an opportunity to revisit some terrific Paul Robertson animation and a killer chiptunes sountrack by Patrice Bourgeault.